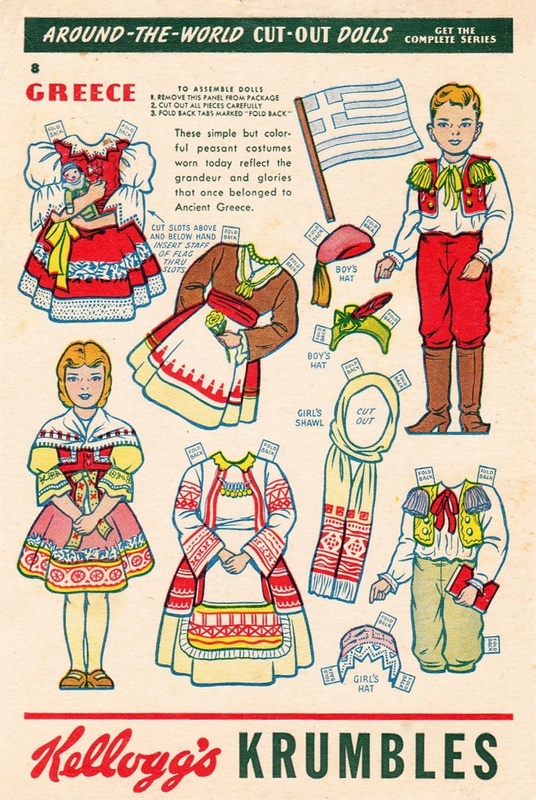 If you’re a female born before 1970, there’s a good chance you played with paper dolls when you were young. 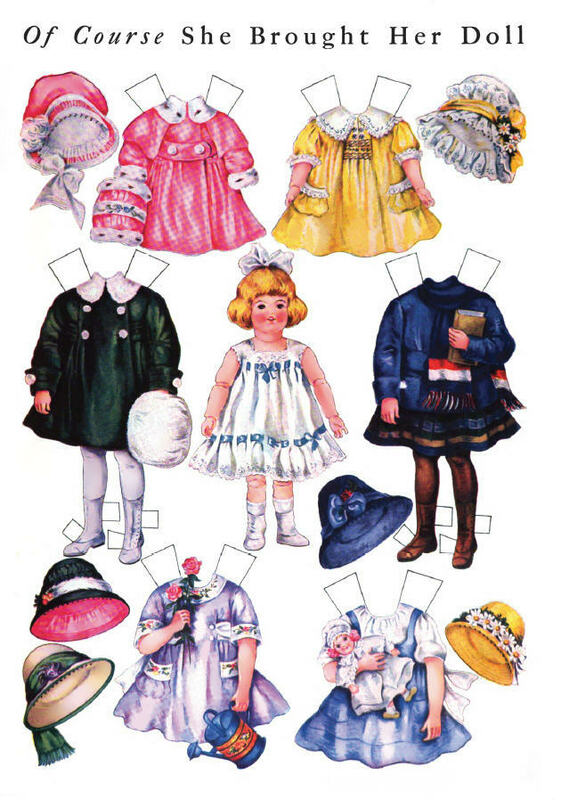 Paper dolls were a popular toy because they were inexpensive to produce and they were often free to consumers. To play paper dolls, a little girl only needed a pair of scissors and a modicum of adult supervision during the cutting phase. 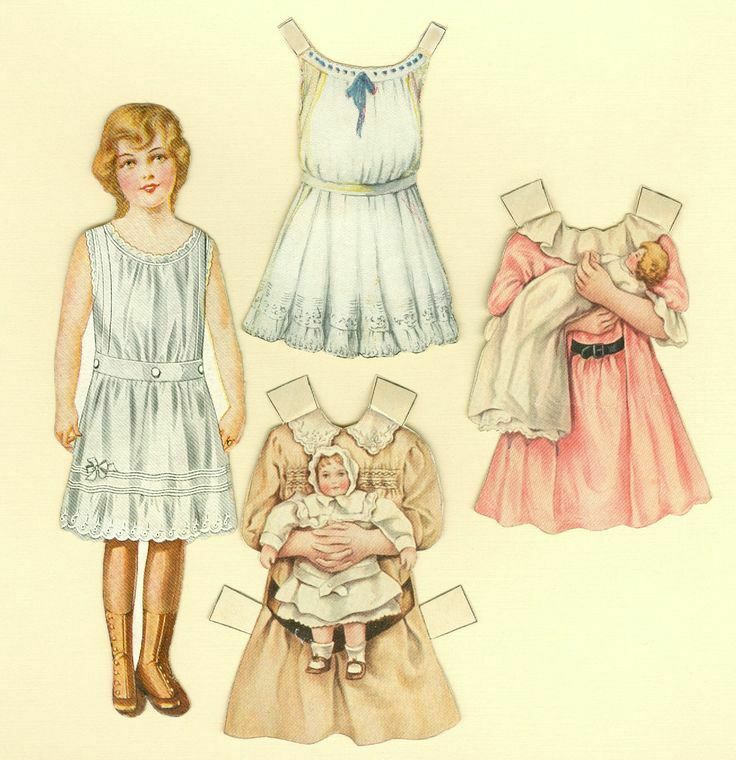 In the early 1900s newspapers printed paper dolls with educational themes. 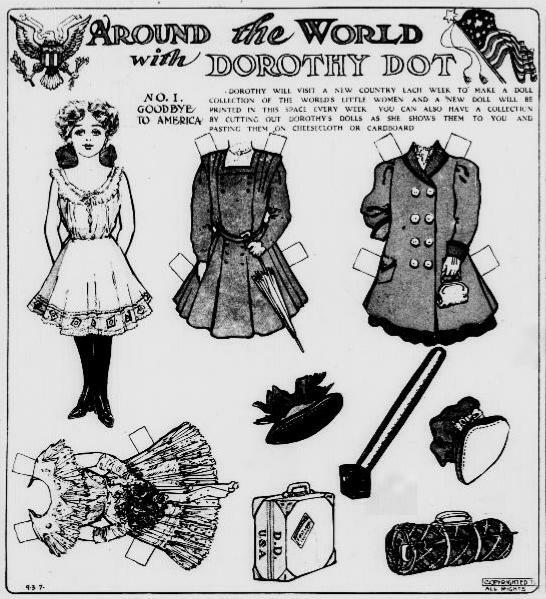 In 1909, for example, major newspapers printed the syndicated Dorothy Dot paper dolls that featured Dorothy traveling the world, meeting new friends and learning about foreign lands. 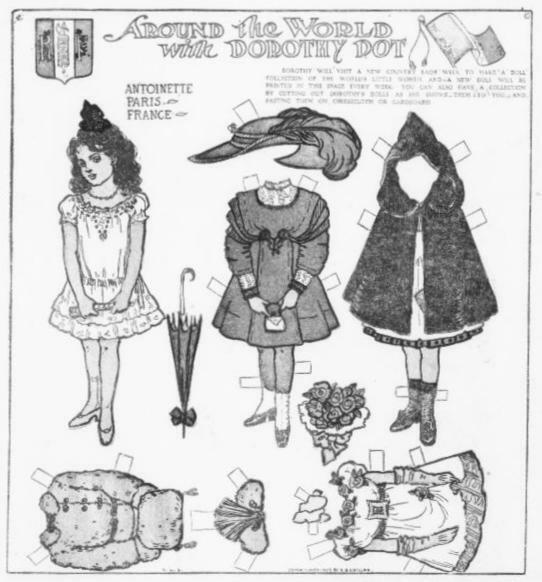 On her travels, the fictional Dorothy Dot visited “Antoinette,” a French paper doll (published in the Los Angeles Herald newspaper in 1909). 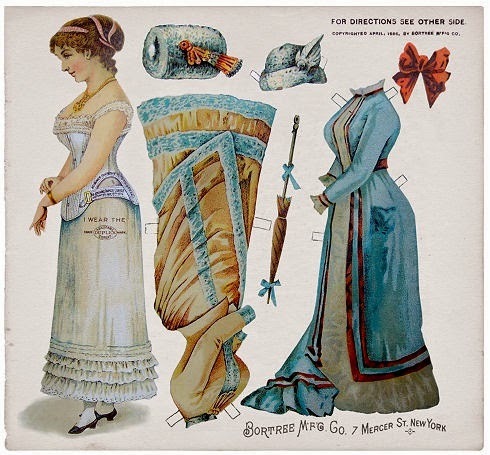 Companies used paper dolls in advertisements for many different products, from ladies’ corsets to sewing threads. 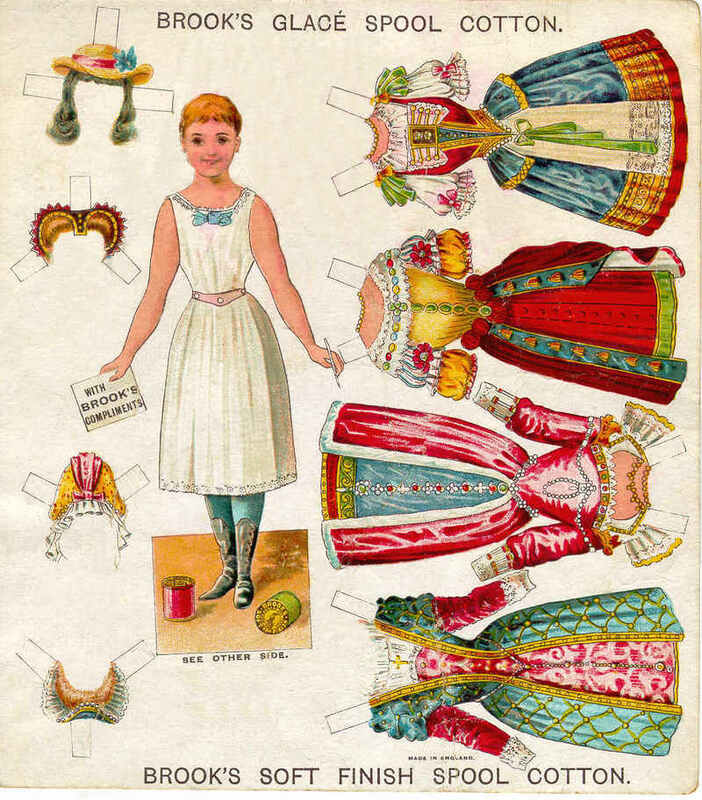 A paper doll compliments of Brook’s Spool Cotton Thread. Sunshine Biscuits (still in business today as the makers of Hydrox cookies and Cheez-It crackers) often included free paper dolls in their product packaging. Other times, they used paper dolls to increase sales. For example, they included this paper doll kimono in one of their magazine advertisements, but the doll could only be found in packages of Sunshine cookies. Isabella Alden didn’t mention specific paper dolls in her books, but given their popularity, there were probably many girls of Isabella’s acquaintance who played with paper dolls. And there are many adults who love them, too! Visit Etsy and you’ll find many vendors who create new paper dolls or reproduce vintage paper dolls from different eras. 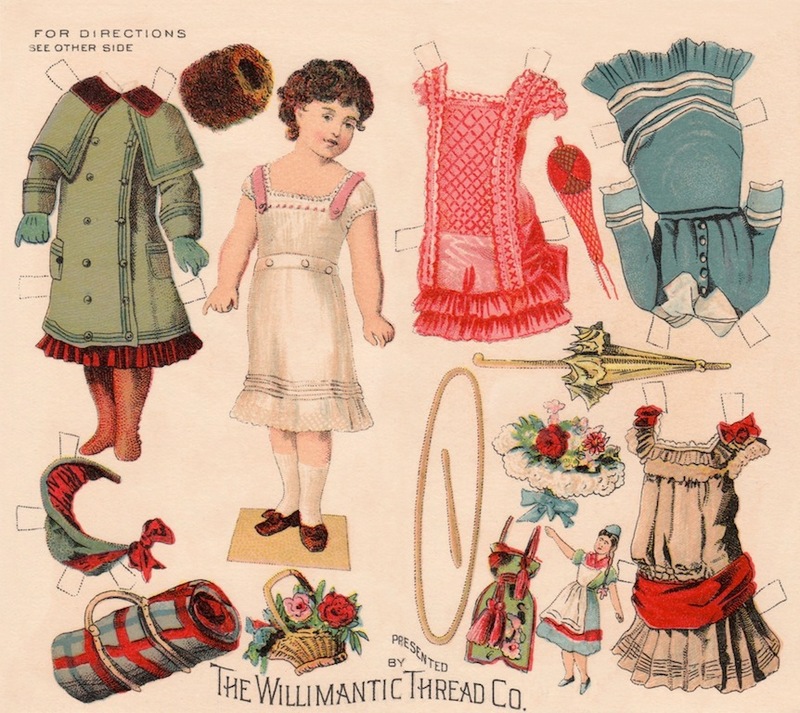 And we found a great site that explains the history of paper dolls and features an interesting blog with many examples of dolls from different decades. Just click here to visit. How about you? Did you ever play with paper dolls? Which was your favorite? Yes, I had many different sets that I wish I still had. I think my favorite were either Magic Mary that her clothes stayed on magnetically or a set given by a steps grandmother which the doll had “real hair and her clothes went over her head and were 2 sided. I played for houy at a time with them. Thank you for the lovely posting. 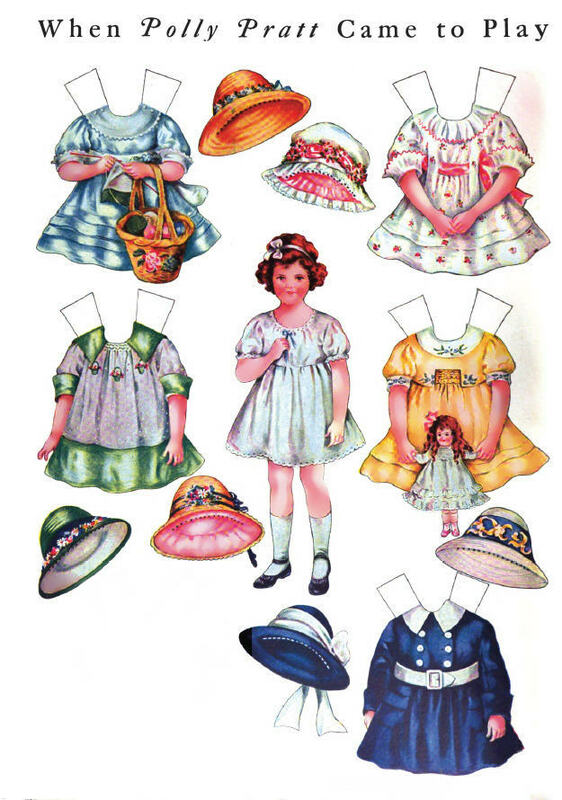 My sister and I loved the Betsy McCall paper dolls from McCalls magazine in the 50s. We also liked Sugar and Spike from the comic books. I’m sure we must have fought over them!